The move gives the Seahawks added depth for its competition behind starter Russell Wilson. Pete Carroll said the Seahawks’ desire to trade for quarterback Brett Hundley is simply in keeping with everything the team has done since he became coach in 2010. “We are just trying to get better and we are competing to find a way in every area of our football, and if this comes through like we are hoping, then we will have done that,” Carroll said. ESPN and the NFL Network broke the story Wednesday that Seattle will send a 2019 sixth-round pick to Green Bay for Hundley, a former UCLA star entering his fourth season. Green Bay made the trade official on Wednesday, but the Seahawks had not announced it as of Wednesday afternoon because Hundley was in the process of flying to Seattle and will need to pass a physical once he arrives. But assuming there are no snags, Seattle appears to have found its backup quarterback for the 2018 season. Austin Davis and rookie Alex McGough remained on the roster as of Wednesday to work behind Russell Wilson, and will probably work through Thursday’s preseason finale against the Raiders since Hundley likely won’t be ready to play. But Carroll said Hundley will be the guy behind Wilson once he arrives, citing both his experience and potential as factors the team likes. Hundley started nine games for the Packers last season when Aaron Rodgers was injured, completing 192 of 316 passes for 1,836 yards, 12 touchdowns and nine interceptions, ranking 30th in the NFL in passer rating at 70.6, and 31st in yards per pass at 5.81. He also ran 36 times for 276 yards, and his mix of running and passing ability make him a good fit for much of what the Seahawks do. 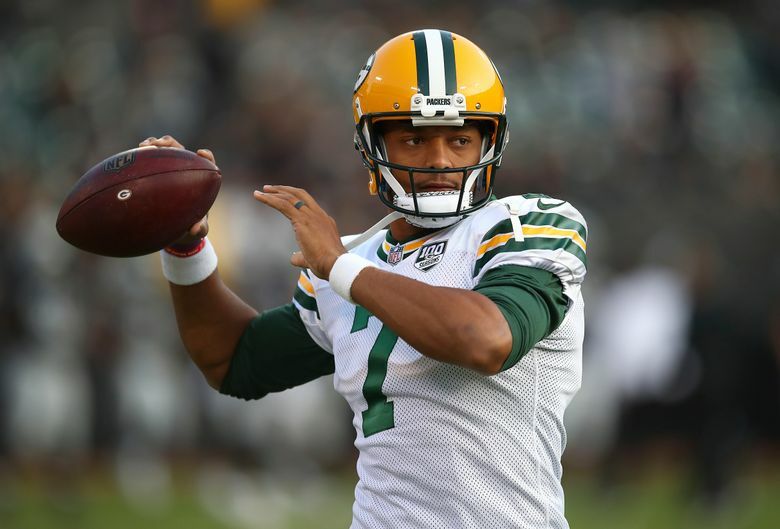 Hundley appeared unlikely to make Green Bay’s roster because the Packers have acquired DeShone Kizer to back up Rodgers. Nether Davis nor McGough, meanwhile, had managed to lock up Seattle’s backup spot after spotty performances in three preseason games. Davis, Seattle’s backup last season, is 7-11 in the preseason, playing just six series for 56 yards, no touchdowns and an interception. McGough, who was a seventh-round pick in 2018, is 24-39 for 285 yards, two touchdowns and one interception. The Seahawks spoke highly of McGough following the team’s rookie minicamp in May. But he has since shown more rough edges, particularly in throwing an interception last week against the Vikings, a game in which he was 5-14 passing. Carroll stressed Wednesday that the team still likes McGough’s longterm potential but said he needs more work. Davis played for the Rams from 2012-14, when current Seattle offensive coordinator Brian Schottenheimer was the offensive coordinator there and appeared to have an inside track to the backup job because of his familiarity with Schottenheimer’s system. But Davis may now be the odd man out since he’s not eligible for the team’s practice squad. McGough has practice squad eligibility and the Seahawks are likely hoping he will make it through to the practice squad. The 6-3, 225-pound Hundley was heavily recruited by former UW coach Steve Sarkisian before signing with UCLA and Rick Neuheisel, (and then later coached by Jim Mora). He was the Bruins’ starter from 2012-14, throwing 75 touchdowns against 25 interceptions while also rushing for 1,747 yards. He was named the All-Pac-12 second team quarterback in 2014, after which he declared early for the draft, and was drafted 147th overall by Green Bay. The move means that Seattle now has five picks in the 2019 draft — a first, third, fourth, fifth and seventh. Seattle also traded its second-round pick to Houston last year as part of the Duane Brown deal. The Seahawks are not expected to receive any compensatory picks in 2019. The Seahawks have had little need for a backup QB since 2012 with Wilson never having missed a game and making 96 straight starts. But Seattle also learned it needed to make the backup QB spot more of a priority after Wilson suffered — and played through — three injuries in the 2016 season. That year the Seahawks had undrafted rookie free agent Trevone Boykin as the backup. But he was waived in March after a domestic violence arrest, which was his second legal incident as a Seahawk.